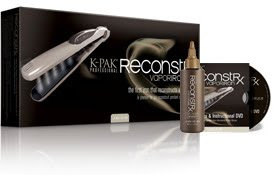 My friend Leticia won the Joico K-Pak Reconstructor Vapor Iron from a school competition. Wow, it's amazing. I couldn't believe how shiny, straight, and soft this made hair look and feel. Most flat irons damage your hair, and eventually causes split ends. This iron uses a conditioning vapor to deep condition, and lock in antioxidants into your hair. It helps maintain your color longer, and reduces split ends by 40%. If your a flat iron user you should check it out. It's amazing.